Under 16 League Cup winners Yaxley Lynx. It was an up-and-down weekend for the Yaxley Lynx Under 16 lads. 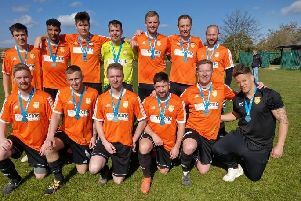 On Friday night they were basking in Cup Final glory but two days later they were smarting from a heavy league loss that seriously dented their title hopes. They owed their cup final success to Matthew Dale. He struck both goals - the second in extra-time - in a 2-1 win over Pinchbeck United at Chestnut Avenue. In Sunday’s league match at Yaxley, the Lynx entertained Eye United looking for a win to close the gap on Division One table-toppers Deeping Rangers Blue. But it all went horribly wrong as they crashed to an 8-3 defeat. The players with their shooting boots on for Eye, who now having a better chance of catching Deeping than Yaxley, were Jack Eldridge (3), Jamie Scott (3) and Harry Catanach (2). In Under 16 Division Two, Netherton United Blue Jays saw their title hopes take a knock when coming unstuck 3-2 against Stanground Sports. Giuseppe Spataro, Charles Minchella and Jack Soper were the Stanground scorers with Charlie Matthews claiming both goals for Netherton. Blue Jays still top the table but have had their lead over Spalding Blue cut to five points and Spalding have two games in hand. On Sunday, Spalding beat March Soccer School 5-2 with Jamie Lagdon netting a treble. There was also a defeat for the Under 16 Division Three leaders as Glinton and Northborough lost the top-of-the-table clash with Parkway Eagles 3-2. Joseph Manning, Tommy Sanderson and Tom Warburton scored for Parkway, who are now just one point behind Glinton with two games each left to play. Deeping Rangers Under 15s remain on course for a trophy four-timer after reaching the PFA Cup final by beating Northern Star Blue 4-2.